Easy to fit in with your print campaign or get out a message tailored for online engagement, online display space runs 24-7. Contact our sales team to select from a set of member newspaper websites and target the readership that trusts them for timely and accurate information. The participating news sites combined reach well over one million page views per month. If the AWNA is serving the campaign, we will make reporting available upon request. A spreadsheet will be sent out at the end of the campaign. Reports can be broken out by day and by ad size and include impressions and clicks. 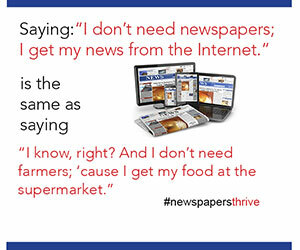 Our member newspapers use a variety of web application frameworks for their web sites. As such, not all sizes are available on every site. Providing more than one version of your web advertising is the best way to ensure placement availability. The AWNA will make commercially reasonable efforts to notify Agency within two (2) business days of receipt of an IO signed by Agency if the specified inventory is not available. The AWNA follows the IAB standards with regards to cancellation. Please note that late cancellations may incur charges. Bookings need to be received seven (7) days before the campaign run date.